Since there are 15 of the largest stars, my intention is to provide 15 tutorials so that there is no need to duplicate any of those. Then you can decide how many you want to make in the other two sizes. If you split it evenly then it will end up in the neighbourhood of two (2) each for the 8″ stars, and five (5) each for the 4″ stars. Of course this is just a suggestion…I’m actually hoping that everyone interprets things a bit differently! 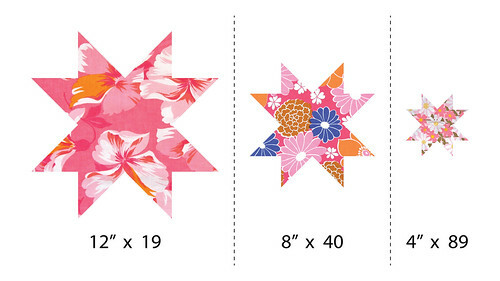 But if you’re the sort of person that wants clear directions, then your assignment for this week is to make one (1) 12″ star, two (2) 8″ stars and five (5) 4″ stars using yesterday’s tutorial. As for a schedule, since I promised “slow” through the holidays, I’ll post at least two more blocks before Christmas (maybe three if things don’t get too crazy), and then we can reevalute the speed once the wrapping paper settles, so to speak. The next tutorial is scheduled for next Wednesday. Hopefully I’ve cleared up a few questions! This post would have been in answer to my comment me thinks… Thanks a bunch… Im one of those uncreative types that needs things spelt out in crayon so I can understand it or I get lost and left behind… Thank you… One day I’m sure I’ll have enough courage to strike out on my own and add my own *PAZAZ* to a quilt… but for now, I think I’m ok with being a copie cat… Toodles! P.S I cant wait to start! thank you for the schedule, this is what we needed to know. But, um, “slow”? That’s 24 blocks befor Christmas, which would be fine in, say, January, but not now! The Flickr posts will be pretty ragged for awhile, I’m afraid. Especially since we don’t all have our fabrics yet. Oh goodness, my intention is not that you actually make 24 blocks in the next 3 weeks! I was just trying to lay out a plan of attack for those people who want specific guidelines. A way to divide up the blocks between the different star variations. I certainly won’t get that many blocks sewn before Christmas! Just aim for the 12″ versions, and as many in the other sizes as you think work for you. OK? Thanks for the print out! I hadn’t thought it, but it will be very useful, especially since I’m not decided on how the fabrics I have should go together and whether they need more friends so to speak. I’m so excited for 15 star variations! I am still mulling over what fabrics to use. I can’t decide if I should go for a red/black/grey pallet or do something more earth toned. Either way, I’ll have to wait until January to begin. I am so excited though! Thank you for all of the work you are putting in for this quilt along! I love your enthusiasm, I love your take on design and I love the designs of the quilts. I’m a FAN! . I can’t find how much yardage is needed for background fabric for full/queen. Anyone? Hi. I love this arrangement of creating a quilt from different stars and was keen to print out the blank to start colouring. But the link keeps taking me to the Craftsy website and I can’t find it there at all. Hi Irina, you’re right! It seems that Craftsy has reorganised things and the link is broken. 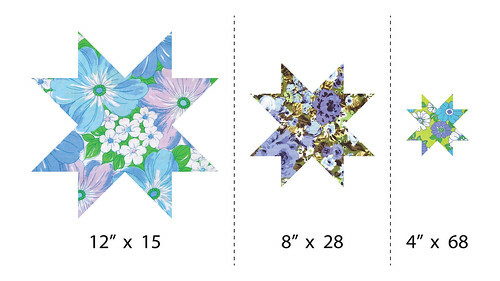 Here is the direct link: https://www.craftsy.com/quilting/patterns/oh-my-stars-qal-planning-tool-/132217 (I’ll correct it in the main post, too.) Thank you so much for pointing out the problem!